Re-blog from PTA: One Voice. Read original Here. My wife and I have four great kids who keep us busier than we care to admit. As any busy parent knows, it’s difficult to plan and carry out activities that are positive, memorable andaffordable. About two years ago, I stumbled into a book that became a high-quality family memory. 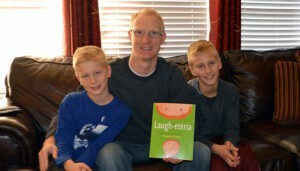 I gave my boys a child’s book of poetry, Laugh-eteria by Doug Florian. My older son quickly found a poem called “Stupid Stew”; it made all of us laugh to tears. Over the next few months, the three of us read every poem in the book together. Reading the poems together provided hours of quality time where we laughed and talked together. The experience showed me that books can have a strong role in my quest to have positive interactions with my kids. Read Together. Before radios, TVs and Netflix, families read together. If this seems corny and old-timey, that’s because it is. Find a book of poetry or any piece of literature that is interesting to you. Sit down with your kids and read it together. Pass the book around and have each person read in turn. You will be thrilled at the experience and discussion that ensue. Tip: put all cell phones completely out of reach as you read together. Make a reading wish list. Sit down and have everyone, parents included, make a list of all the books each person wants to read. Post the list on the fridge and check up on who’s reading what books regularly. Tip: this is not a “to do” list to badger each other about. It’s a fun list without a time limit. Schedule a family outing to a used book store. Used book stores are just as interesting and fun to visit in 2014 as they were in 1990. Let the kids explore and choose their own books. Everyone will be excited to read their new-found treasures. Books before movies. If a child wants to see a book-based movie, make reading the book a contingency of seeing the move—for both adults and children. Go see the movie as a family and discuss the merits of both. All these have one indispensable ingredient: the adult. You must do these activities with the kids. As you do any or all the above, you demonstrate that reading and learning are important to your family culture while you create high-quality memories. I’m not alone in my quest to find meaningful activities that don’t cost a fortune or involve stressful planning. Reading is an achievable daily activity you can within your busy schedule. Try one or more of the above and I promise that good experiences and memories will flow from your efforts. Jake Ball founded Children’s Bookstore to create a truly independent bookstore that is 100% dedicated to juvenile literature. Children’s Bookstore provides online book fairs to schools, libraries all over the U.S. Jake and his wife have 4 children and reside in Meridian, Idaho between their school and a large corn field. Children’s Bookstore is a financial sponsor of National PTA, and has been invited to submit a blog post as part of their engagement with PTA. National PTA does not endorse any commercial entity, product, or service, and no endorsement is implied by this content. Common Core not the “Horror” you keep hearing about!